. : Klister Licker Shop :: Ski XCOttawa.ca :: Skiing in Ottawa and Gatineau Park :. Klister Licker in Support of XC Ottawa . 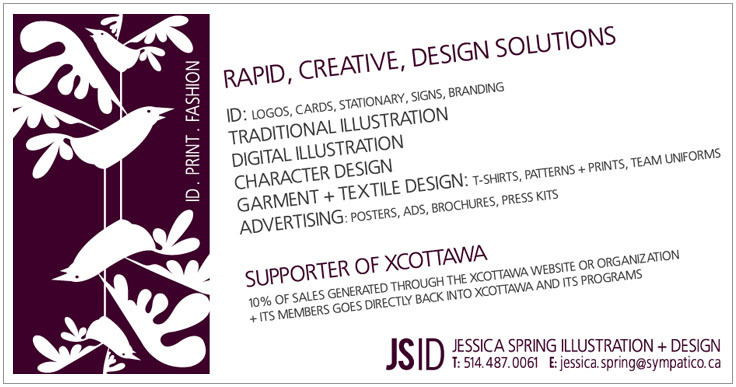 . .
Jessica Spring of JSID has designed some cool T-shirts and made them for sale in support of XC Ottawa. All shirts are 100% high quality lightweight cotton with an xcottawa logo on the back. Check `em out, buy `em up! Please note prices are in $US. Have a look at the delivery costs.